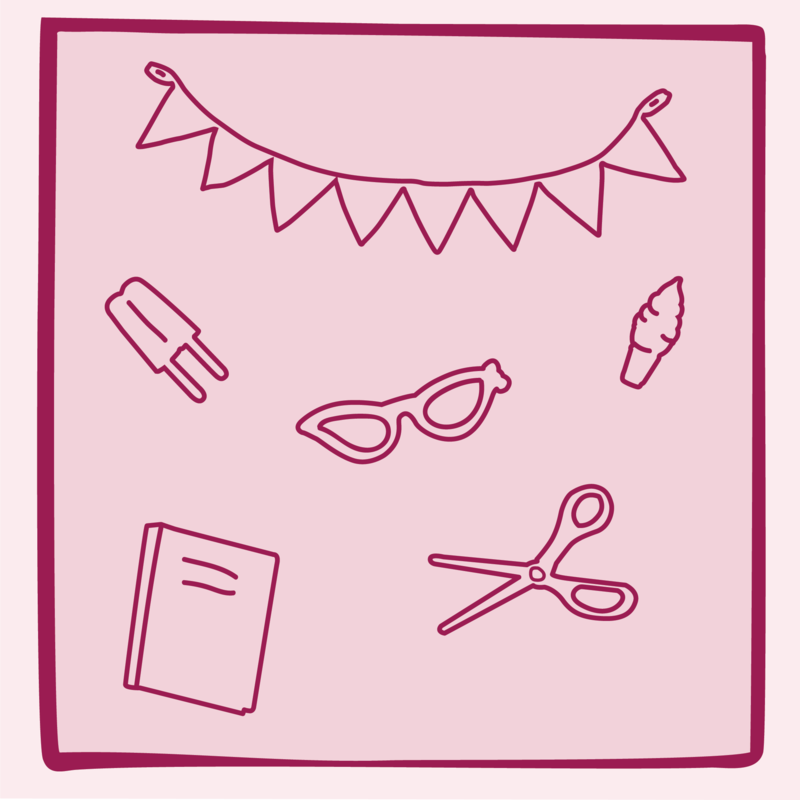 https://s3-ca-central-1.amazonaws.com/media.ogdolls/20181127222607/BD37477_NEW_Run_For_Fun-all-components.png Category: Fun and Adventure. 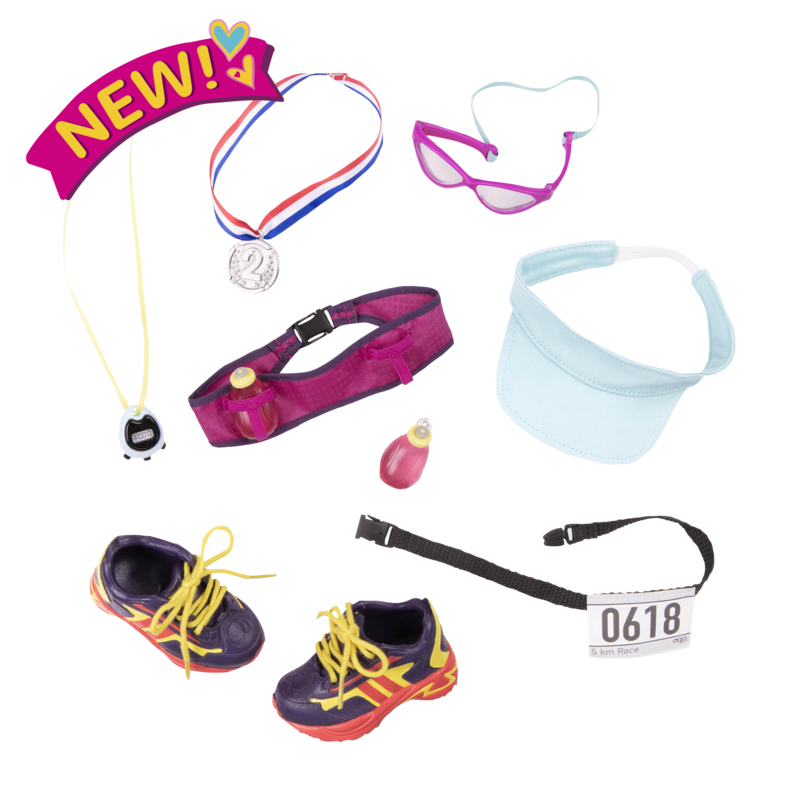 Race for the finish line with these marathon accessories for 18-inch dolls! Running is so much fun! How fast can you go? 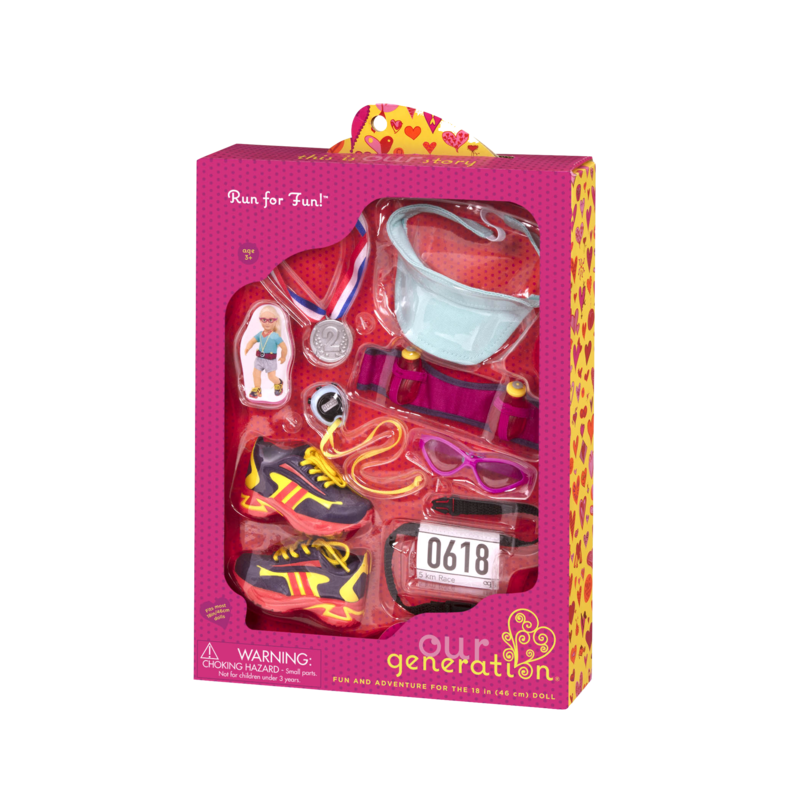 Great training for chasing big dreams is easy with the Our Generation Running Accessory Set – Run for Fun! for 18-inch dolls! 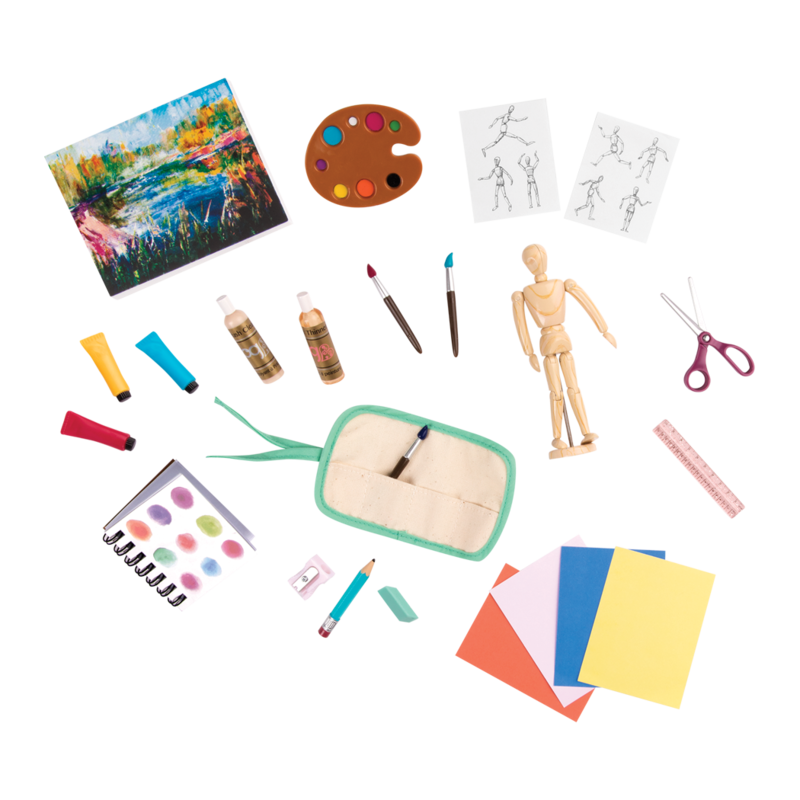 Fun Athletic Accessories for 18-inch Dolls! A sprint, a jog, or a marathon…we kids sure know how to move! 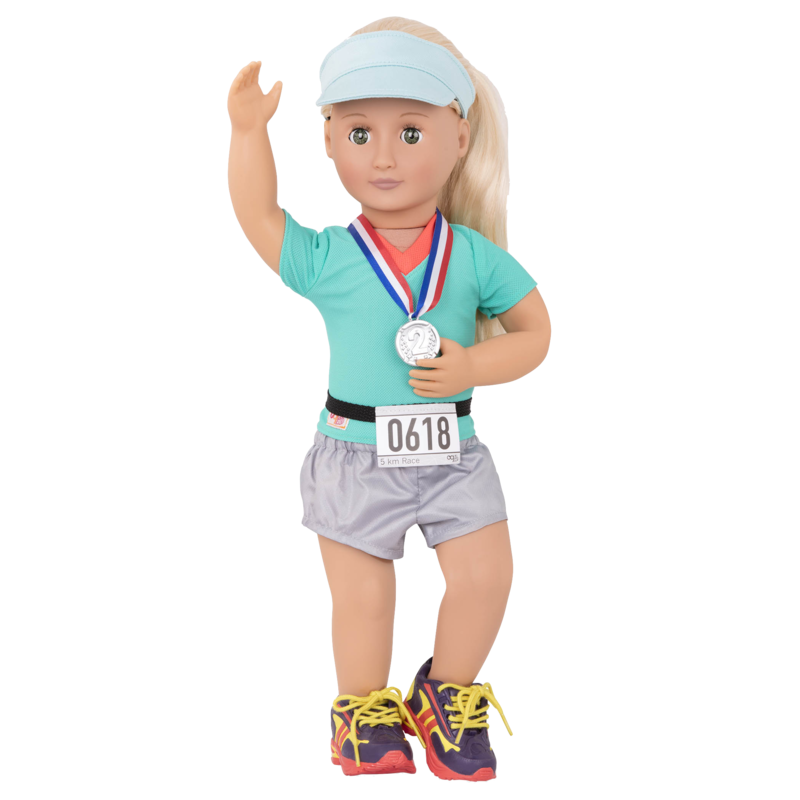 Suit up in the long-distance running shoes, the running belt with two water bottles, and the visor to keep the sun off your doll’s face. 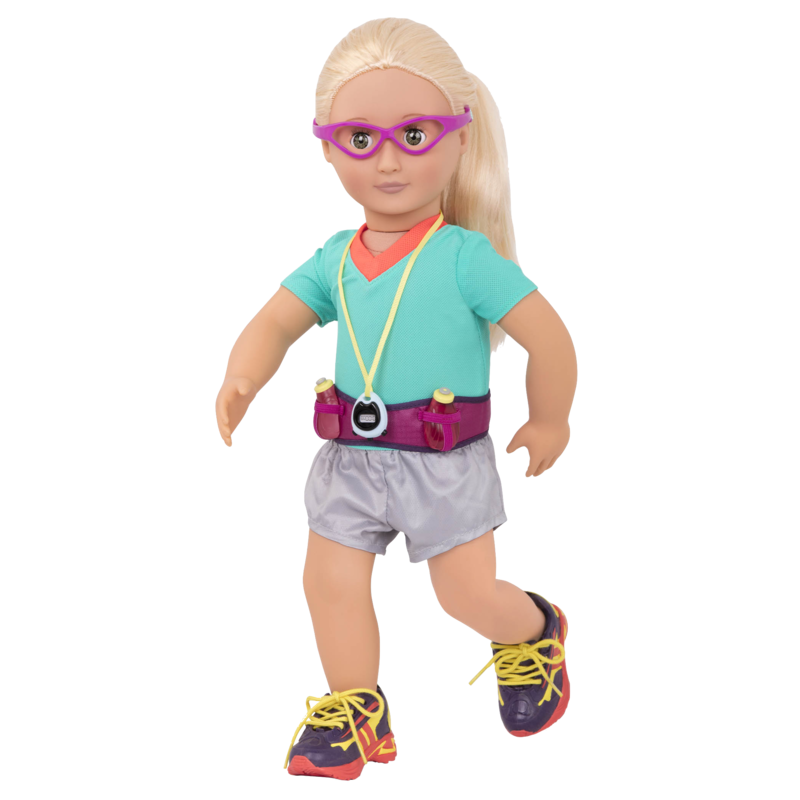 Train for marathon running and use the stopwatch to time her runs and see how far your doll can go in the shortest time! 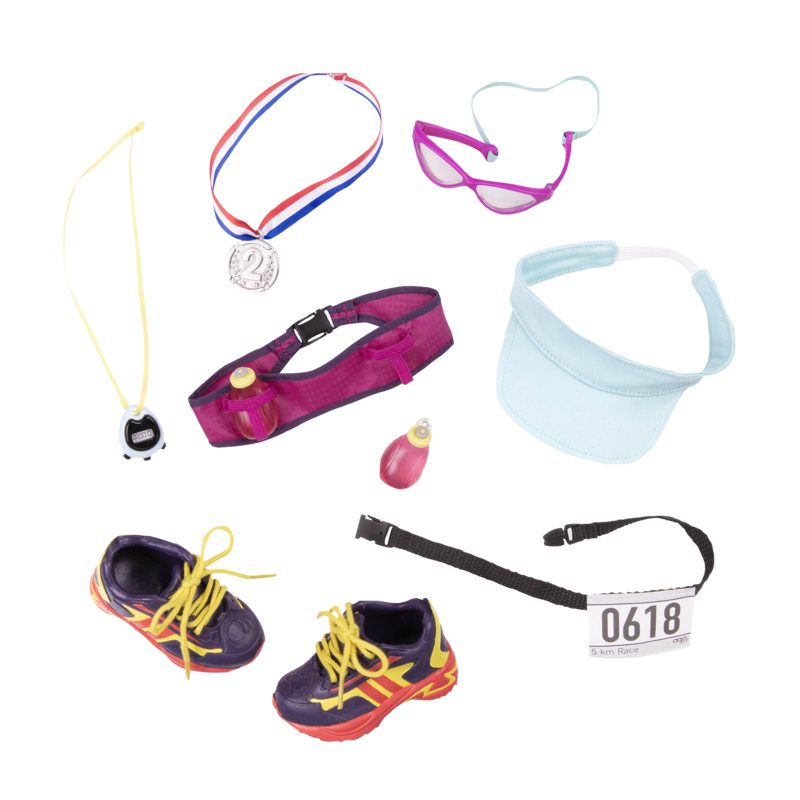 When race day arrives, the race number belt will identify your doll to the judges so they can award her the silver medal. It’s not about winning, it’s about doing your best and having fun! 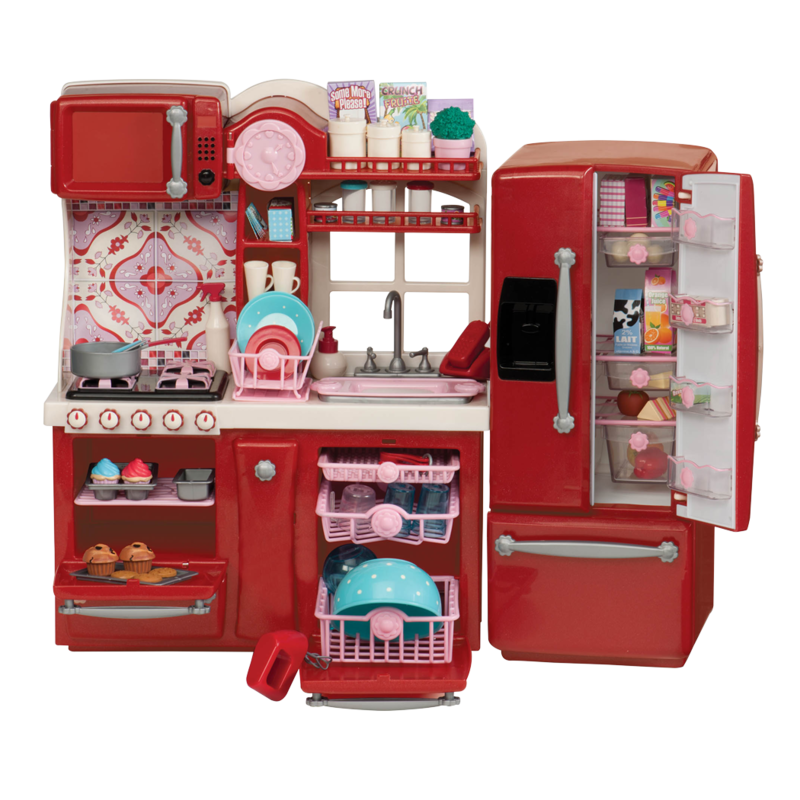 There’s a whole world of fun and adventure for 18-inch dolls to discover, with lots of dolls, accessories, and outfits to choose from! 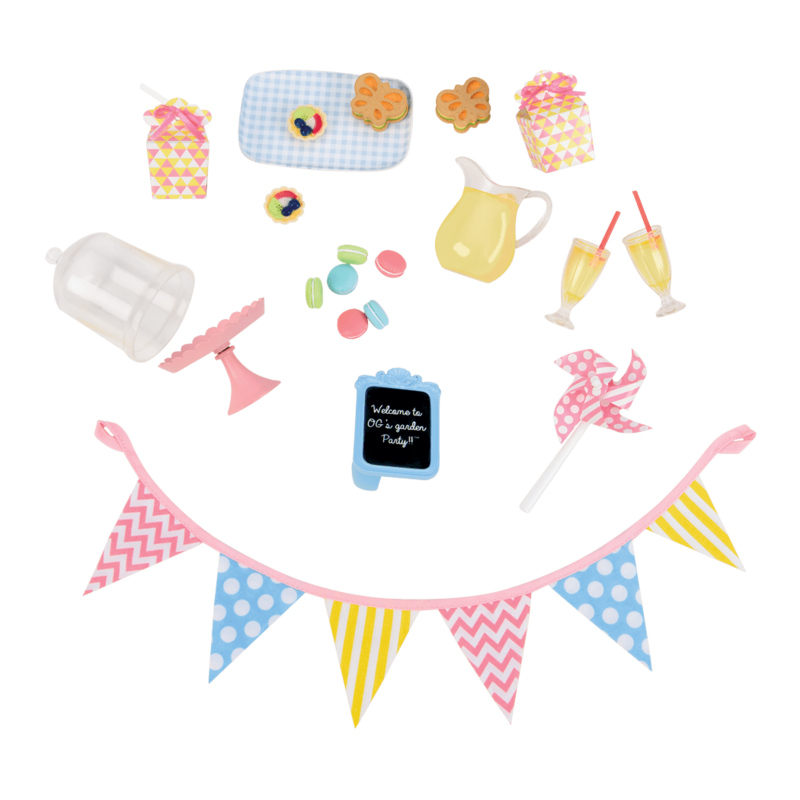 Have you met Ginger, the doll in the pictures modelling the Run for Fun accessory set? Ginger is going to set a World Record in long distance sprinting!! What kind of World Records do you want to achieve? 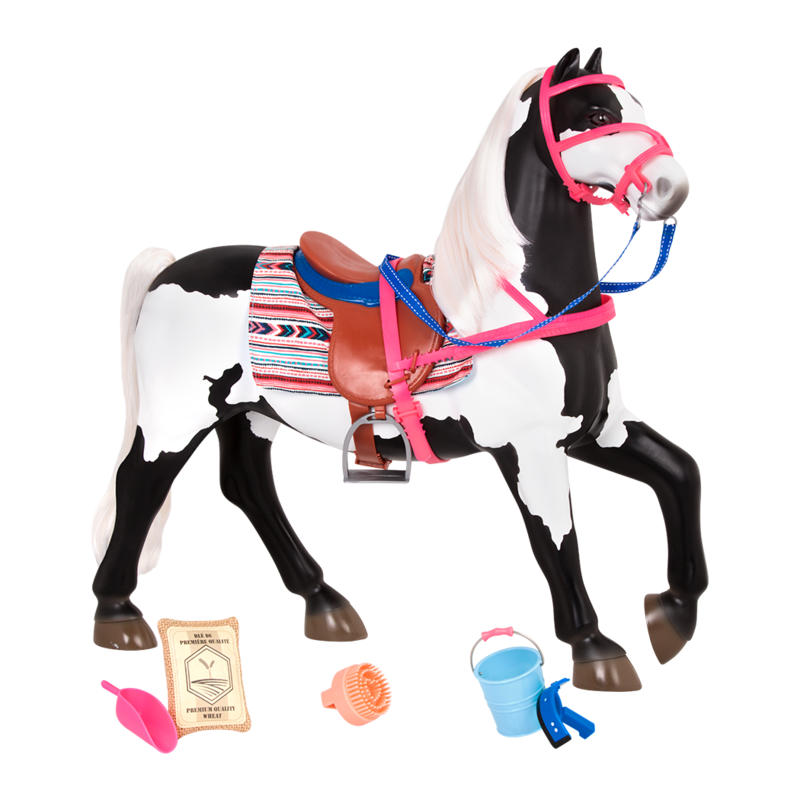 For dolls and kids who loves sports, there are a ton of great outfits and accessories to choose from, like the Hit a Homerun outfit, or the Karate Kicks outfit. The sky is the limit for what you and your dolls can achieve!